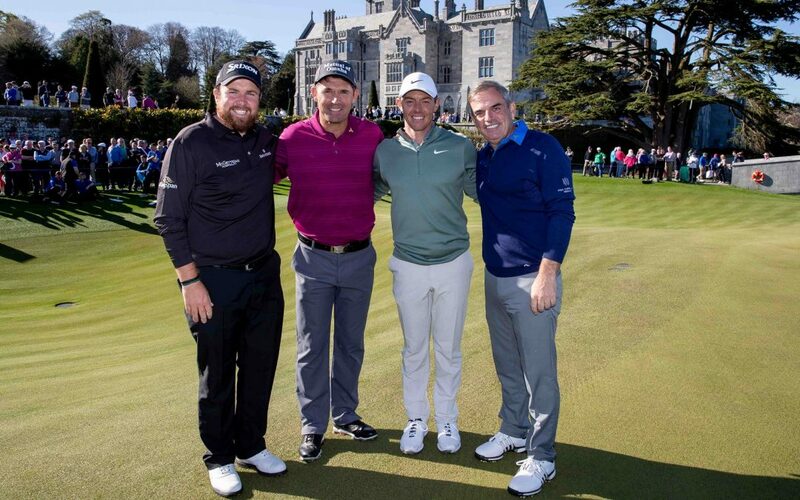 Four of Ireland’s most celebrated golfing stars will today conduct the official drive-in at The Golf Course at Adare Manor, set to become one of the most recognised layouts in world golf. 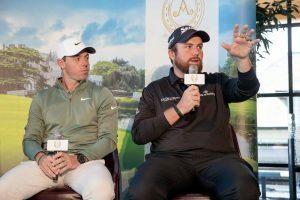 Rory McIlroy, Padraig Harrington, Paul McGinley and Shane Lowry will hit the inaugural tee shots of the wholly-reconstructed Tom Fazio design, competing in a €500,000 charity match to mark the milestone occasion for Irish golf. 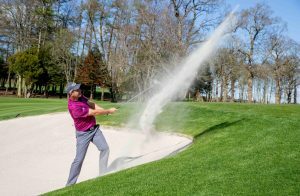 The Golf Course at Adare Manor will be unmatched in terms of quality of conditioning, utilising practices and products like no course to come before it. Over a two-year reconstruction period, the Fazio Design team has established a 7,509-yard championship golf course created to the most exacting of standards with the goal of establishing the course amongst the world’s best and hosting the world’s most prestigious events. 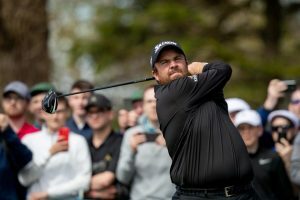 As well as number of consultants and contributors, Fazio requested the involvement of decorated golfers to give feedback on plans throughout the project, seeking the observations and expertise of both Harrington and McGinley as two of Europe’s most experienced touring professionals in finalising routing, contouring and grass selection. 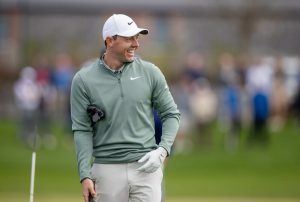 As it looks set to pique the interest of golfers across the world, Adare Manor has obtained critical acclaim, even before the first golf ball was struck, earning a place within Golf Digest’s coveted Best Golf Resorts in Great Britain and Ireland list. The Golf Course at Adare Manor is the first in Europe to feature greens of super fine bentgrass. Through detailed analysis, Pure Distinction ‘the ultimate bentgrass for smooth and true greens’ was chosen for its USGA putting surfaces (12,055sq m in total) whilst A4 bentgrass (regularly used upon the greens of many notable courses worldwide) was chosen for all approach surfaces. The results of both practices is the creation of green complexes matching the quality and conditioning of the world’s very best. The course is also one of only three in the UK & Ireland where all 18 greens incorporate the SubAir Aeration System, used to remove moisture through vacuum pumps, guaranteeing firm play each day. 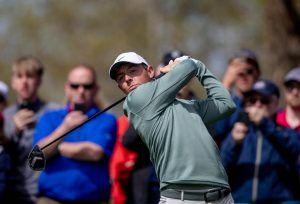 While the course features little in the way of heavy rough, Adare Manor’s greens will present a considerable challenge. Raised high above their surrounds, an excellent short game will be required to negotiate their many contours. Sweeping plateaus are a common feature, a test exacerbated by perennially speedy greens. During the construction phase, 220,000 tonnes of sand were used throughout the property, combining with 77,000 linear metres of gravel trenches (50 miles) and perforated pipes to allow for free-draining even in the worst weather conditions. 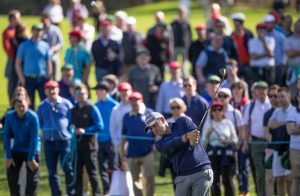 The Golf Course now spans 170 acres of low-cut, sand capped grass, wall to wall, with no rough in play, catering for a brisk pace of play with little time required to find balls. Arguably, like the very best championship designs, The Golf Course at Adare Manor saves its most exciting holes for the final stretch, offering a thrilling conclusion to any match. Four of these feature the strong presence of water starting on the par-4 14th, which plays towards a green overhanging a lake and set against the backdrop of the centuries-old Desmond Castle. Hole no.15 will be a driveable par-4 for many modern-day tour players, but it is dominated by the River Maigue, which runs the length of its right-hand side. Bravery and accuracy will be required but birdie or better are a realistic reward. Water is in play again at the short par-3 16th but with 60-metres of green to play with, those who fail to find the surface will be disappointed. Over its closing pair golfers will be treated to two very different tests, with 17th being a tree-lined par-4 of some 523 yards from the back tees, while the closing hole, played directly towards the Manor House, is a par-5 that can be reached in two shots, although the River Maigue and one of the course’s most treacherous greens demand the utmost accuracy at all times. 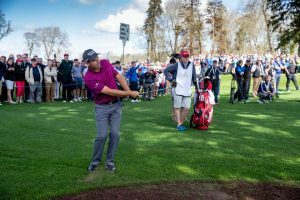 Anticipating The Golf Course at Adare Manor will become one of golf’s most sought-after event venues, Fazio Design was instructed to factor in all necessary measures to cater for hosting major occasions. As such, The Golf Course at Adare Manor stands as the first globally to be created in such event-ready state, with fibre optic conduit buried within each hole to provide power and telecommunications connectivity for broadcast, whilst an advanced road network has also been built into the property without impacting on aesthetics. Collaboration on making the design a reality came from a number supporting parties. Atlantic Golf Construction, known for producing work of the highest standards, were crucial in providing the man power and turf management on site; their crew reaching numbers of 150 on-site at times, as well as seven bulldozers and 38 track hoes. Other parties involved included: agronomic consultants, Turfgrass Ireland; hydromulch and soil amendments from Profile Products; seed from Tee-2-Green; turf from Tillers Turf; InTurf, providers of all sod for the bentgrass approaches and the first 11 holes; bunker lining by Capillary Concrete; scanning by Greenscan 3D; a new irrigation system from Toro; and installation by MJ Abbott. Significant work has been conducted throughout the site to remove any non-native species, such as laurels, ensuring a clean appearance, devoid of any overgrown areas. These improvements have aided visibility, as well as the movement of air and sunlight, allowing for even better quality across all playing surfaces. In addition, 127 mature trees have been planted to help frame each hole. Water features are present on 14 holes with a number of man-made lakes, streams and the River Maigue regularly in play. As these intersect the course at so many points, there was a requirement to create a total of 12 new hand-cut stone bridges, providing another signature feature of the property. The Golf Course at Adare Manor has the unique honour of featuring fewer bunkers than any other Tom Fazio-designed course. Just 41 capillary concrete bunkered, filled with the finest Scottish sand take position on course. However, each has a very strategic purpose, determining golfers’ approaches to play throughout. To find out more about Adare Manor, visit: www.adaremanor.com and follow @AdareManorHotel (Facebook), @TheAdareManor (Twitter) and @TheAdareManor (Instagram). To download high-resolution imagery and video content of The Golf Course at Adare Manor and the Adare Manor Resort, click here. The 5* castle hotel is situated in the heart of Adare Village in County Limerick. Steeped in history and surrounded by medieval ruins, Adare Manor, which is owned by the McManus family, was unveiled following a groundbreaking transformation in November 2017. The largest restoration project of its kind in Ireland, the renovation and expansion honours the building’s architectural heritage as a Neo-Gothic masterpiece while incorporating the latest in contemporary luxury. Most notably, the expansion included a new 42-bedroom wing, increasing accommodations to a total of 104 guest rooms and a ballroom which can host up to 350 guests. The 842 acres of Adare Manor’s beautiful parkland, walled gardens and walking trails were also enhanced and offer an extensive range of pursuits, including falconry, archery, clay pigeon shooting, fishing, state-of-the-art La Mer spa and cinema.